Okay, this is an awful picture-Tony was so hungry he was rushing me-but I had to include it anyway because my fish dishes are my favorites. Since we didn't really get to celebrate Valentine's Day on Saturday (stuck working), Tony and I made some badass fish tacos. Mostly Tony made them, but I was sous chef. First we made a chipotle mayonnaise out of 1/2 a beaten egg, adobe sauce and peppers, salt, lime juice and olive oil. We mixed that in with shredded cabbage, red onion and green onion and put it in the fridge to get all delicious. Then Tony taught me how to make a tempura batter (flour and club soda, which makes the air bubbles!) and we fried mahi mahi. 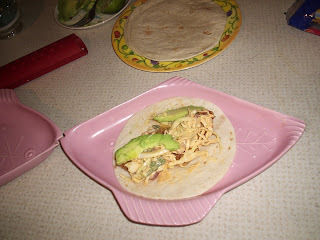 Then we layered the slaw, fish and fresh avocado on a tortilla and squeezed some more lime on it. Voila! Delicious! 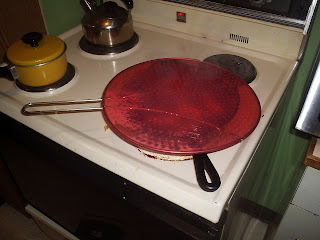 This silicon frying screen is a must by the way.